This widget will allow you to insert a fully functional Calculator on any Adobe Captivate slide. The Calculator Widget allows you to transfer the result automatically to a user defined Captivate variable if you want to do further processing of the result. You can allow the user to move (drag and drop) the Calculator around on the Adobe Captivate slide in case you have a lot of content on your slide. You can set the Calculator to be visible by default or you can control it (show and hide) with your own button in Captivate. The widget can be inserted on a Master Slide if you want it to be available throughout the project or you can insert it on single slides where you see fit. Transfer result to Captivate variable..: Enable this to make the widget transfer the result from the calculator to a custom Captivate variable named “v_result” every time the user clicks the “equal” button. You will need to manually create the v_result variable yourself. Use your own button in Captivate…: Enable this to make the Calculator show/hide when clicking a button on the Captivate slide. You will need to create a button on the slide and add the suffix “_calc” to the item name. If the above option is not enabled then the widget will be visible from the start (useful on single slides). The Calculator Widget for Adobe Captivate works with Adobe Captivate 5, Adobe Captivate 5.5, Adobe Captivate 6.x, Adobe Captivate 7, 8 and Adobe Captivate 9. 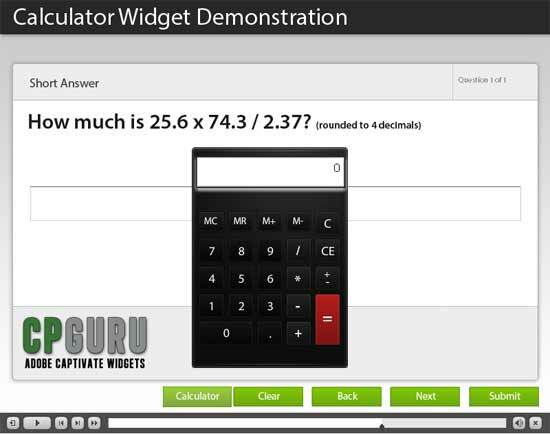 A demonstration of the Calculator Widget for Adobe Captivate can be seen here. The Calculator Widget for Adobe Captivate only works with Flash based output. It will not work with HTML5 projects. Keyboard commands are not activated for the calculator so you will need to click on the buttons with your mouse. I have chosen not to activate keyboard shortcuts as this may very well conflict with shortcuts defined directly in Adobe Captivate. If you think this widget would be useful to others please share with your network using the buttons below. Is this widget HTML5 compatible? No the Calculator widget is not HTML5 compatible.